Dr. Daniel Dawson is the ob/gyn hospitalist medical director at CHI St. Joseph Health Regional Hospital in Bryan, TX. Dr. Dawson is a graduate of Texas A&M who returned to the Brazos Valley to practice in 1997. 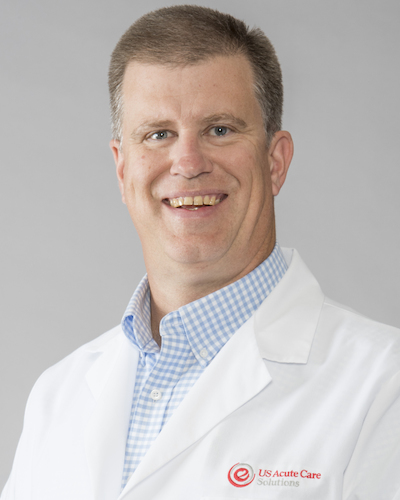 After earning his medical degree from Baylor College of Medicine in Houston, he went on to complete his residency at UT Southwestern Medical School and Parkland Hospital in Dallas before moving to the Brazos Valley. Dr. Dawson received his MBA from the University of Texas at Dallas in 2015. Dr. Dawson participates in the clinical training of medical students at Texas A&M Health Science Center and is an Assistant Clinical Professor at the Texas A&M Health Science Center. At St. Joseph, Dr. Dawson has served as Chairman of the Department of Ob/Gyn, Secretary of the Governance Council, Member of the Multidisciplinary Peer Review Committee, and Member of the CEO Council. He was instrumental in the formation of St. Joseph Health Partners, a commercial and Medicare ACO with more than 200 physician members, and served as the organization’s chief medical officer prior to leading the development of ob/gyn hospitalist services. His clinical interests include infertility, advanced laparoscopic and robotic pelvic surgery, along with minimally invasive in-office procedures and general ob/gyn.